Happy first day of spring! 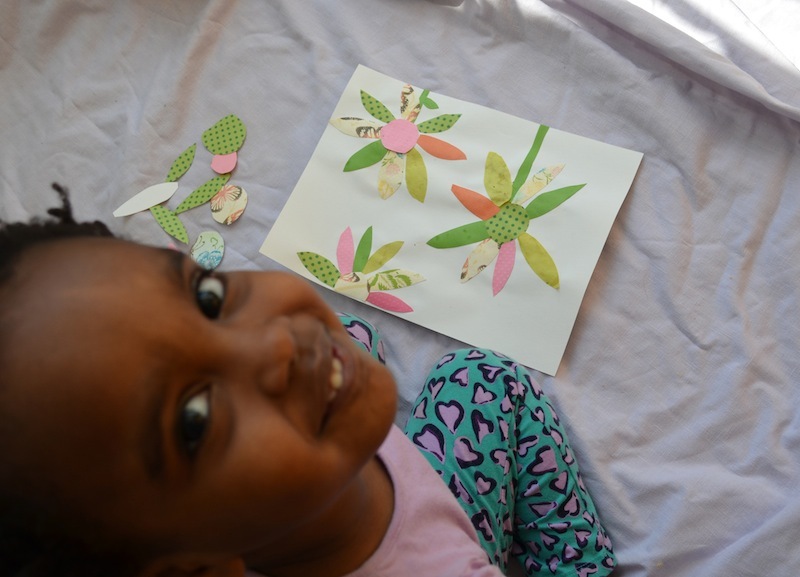 Along with spring cleaning, another yearly tradition in our house is making floral themed arts-and-crafts projects. Since my three and five-year-old both really love partaking in this activity, I set out to find some arts and crafts in which they can play big parts. Between painting, stringing, cutting, gluing, and of course, glittering, these varied projects are sure to capture your child's attention and keep their hands busy. Added bonus - they will brighten up your home too. 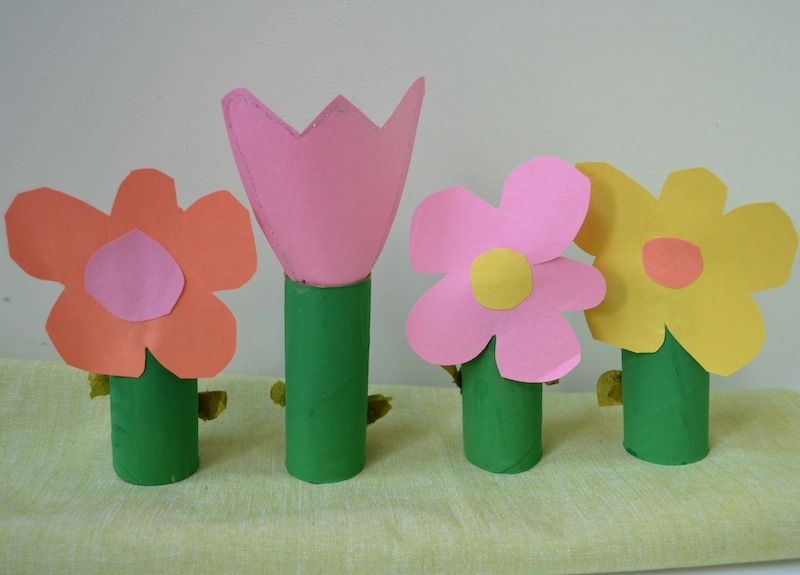 So whether they are little crafts for a rainy afternoon, a party activity, or putting your overflowing recycled craft supply bin into good use, we hope these 6 projects give your family some hands-on fun and a big dose of flower power. This craft makes for a cute table decoration in lieu of fresh flowers and uses up a ton of toilet paper rolls. Paint toilet paper rolls green and let dry. If you’d like, glue on tissue paper or other paper cut to look like leaves or petioles. 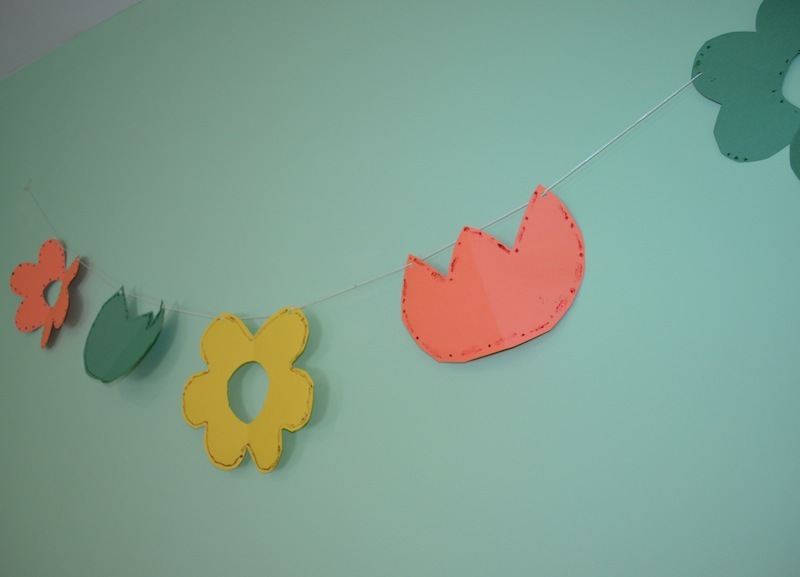 Next, using a sturdy paper such as construction paper, cut out flower shapes. 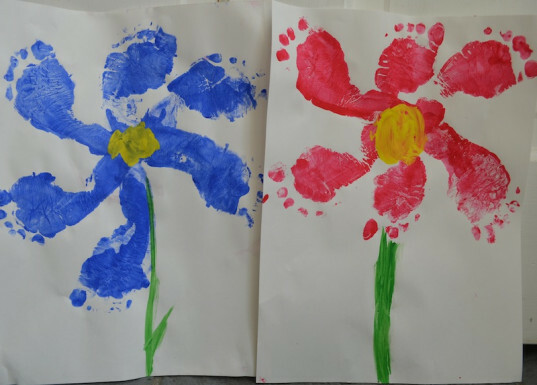 Your child can decorate these with glitter or markers as well. Glue the flowers to the front of the toilet paper roll or secure them inside the top opening or the toilet paper roll. I have a terrible time throwing away paper scraps, and this craft makes great use of those extras. Using any scrap paper you have (or even newspaper), cut out round centers and petals for flowers. If your child is older, let her do the cutting, though you may want to give her a few samples for size and shape. Your child can glue the scraps to make colorful collage flowers using the variety of patterns and prints on your paper scraps. This is one of my very favorites, and your kids will LOVE creating it, especially since it involves getting messy. Put a little washable paint in a shallow container. Have your child sit down (unless he has very good balance!). Dip his foot into the paint, covering as much of the pad and sole of the foot as possible. Have him press firmly onto a piece of paper. Repeat, moving the paper in a clockwise motion, until you have the desired number of “petals.” Add a center and a stem and let dry. An inexpensive way to decorate and craft with even the youngest of kids. Smooth out cupcake liners and attach to paper. Glue a center to the flower and glue on a stem. You can use elements such as fringed construction paper as grass or cut out butterflies, bees, and other creatures to create a spring scene. My younger child LOVES to practice cutting. For this simple chain, fold a piece of construction paper in half. 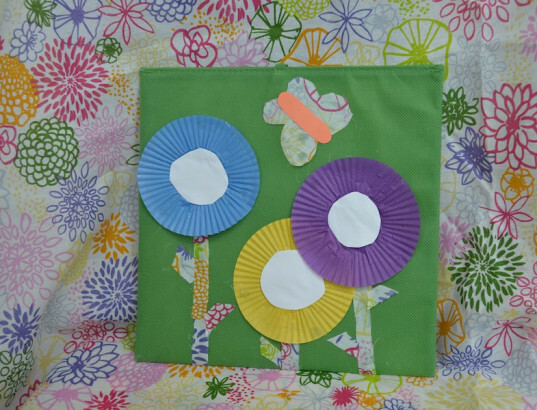 Have your child cut out a funky flower shape. 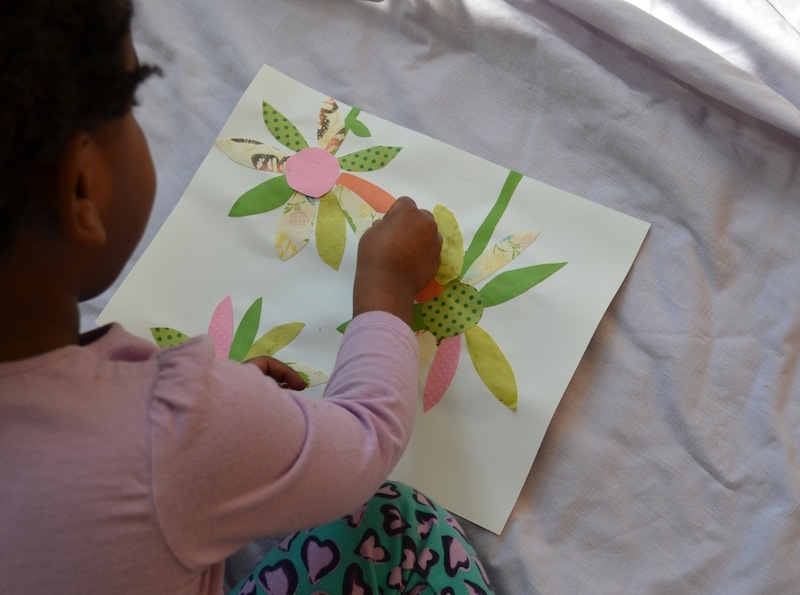 Unfold the paper to show them their creation, decorate the flowers as desired, punch holes into the top of the flower, string, and hang up the chain on walls or in doorways as a cheerful spring reminder. Tissue paper and coffee filter flowers have been around forever, but they are so fun to make. My favorite tutorial for making tissue paper flowers is here, but the flowers can be as simple as folding a pile of tissue paper, cutting the pile into rounds, poking the pile around the middle with a pipe cleaner (the “stem”), poking another hole back through to secure and connect to the stem, and then bunching up the individual pieces to make petals. If using coffee filters, you can use pipettes and food-coloring dyed water to make a tie-dyed effect. Let dry and then stack and proceed in the same fashion. This craft makes for a cute table decoration in lieu of fresh flowers and uses up a ton of toilet paper rolls. Paint toilet paper rolls green and let dry. If you'd like, glue on tissue paper or other paper cut to look like leaves or petioles. Next, using a sturdy paper such as construction paper, cut out flower shapes. Your child can decorate these with glitter or markers as well. Glue the flowers to the front of the toilet paper roll or secure them inside the top opening or the toilet paper roll. This is one of my very favorites, and your kids will LOVE creating it, especially since it involves getting messy. Put a little washable paint in a shallow container. Have your child sit down (unless he has very good balance!). Dip his foot into the paint, covering as much of the pad and sole of the foot as possible. Have him press firmly onto a piece of paper. Repeat, moving the paper in a clockwise motion, until you have the desired number of "petals." Add a center and a stem and let dry. 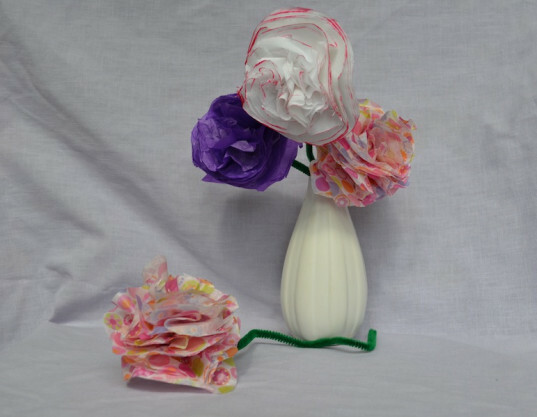 Tissue paper and coffee filter flowers have been around forever, but they are so fun to make. My favorite tutorial for making tissue paper flowers is here, but the flowers can be as simple as folding a pile of tissue paper, cutting the pile into rounds, poking the pile around the middle with a pipe cleaner (the "stem"), poking another hole back through to secure and connect to the stem, and then bunching up the individual pieces to make petals. If using coffee filters, you can use pipettes and food-coloring dyed water to make a tie-dyed effect. Let dry and then stack and proceed in the same fashion.